Improvisation was the name of the game during this very memorable Cambodia engagement session we did a couple of months ago. 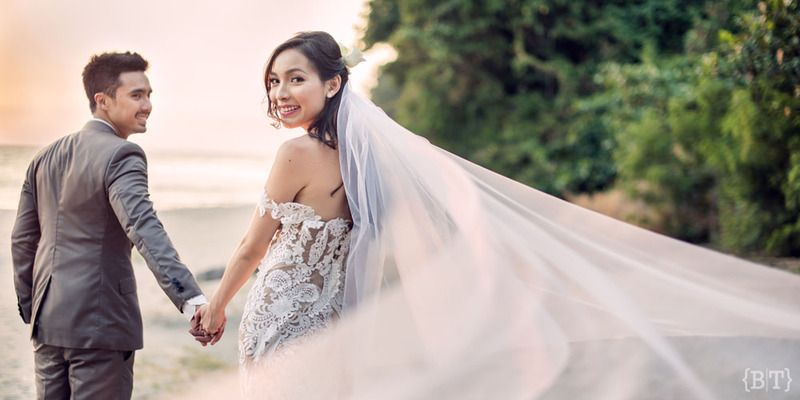 As photographers, we kid you not, we would do just about anything to take that perfect shot for our couples–and this one was definitely no exception. With all the suspense of getting caught, hiding, and pretending to be plain old tourists in the temple ruins, the whole experience felt like we were in a game of “Temple Run”! Nevertheless, the shoot with our wonderful couple, Jeremy and Melissa, was fun, exciting, and most importantly successful as can be. Right off the bat, we already knew we would constantly be on the lookout for guards as we didn’t have the necessary requirements to hold a shoot in the temples. We were already so nervous and sure enough, ten minutes into the shoot, guards swarmed the area. And the dreaded question finally came up. “Delete all the photos,” one guard told us. We reluctantly obliged–we wouldn’t want to become an episode of “Locked Up Abroad” if we didn’t follow! Luckily, we backed up the photos in a separate memory card so no damage was done. We were then led by our tour guide to a different spot where we could continue on with the shoot. We made do with what we had and we were definitely pleased with the results. Cambodia truly lived up to its rich history and culture–and we made sure to capture every bit of it whilst still looking unique. Everyone had a good time exploring and capturing moments. Not only can we say ‘challenge accepted’, after this 2-day engagement shoot filled with thrill, excitement, and challenges, we can confidently say ‘challenge accomplished’ as well. Scroll through Jeremy and Melissa’s pre-wedding shoot for more!